Addiction is defined as a chronic, relapsing brain disorder that is characterized by compulsive behavior despite the harmful consequences that it may have. Drug and alcohol abuse can lead to many physical, psychological, and social problems. Not only will the behavior result in health-related issues, but it will affect relationships with family members and friends as well as potentially resulting in getting into trouble with the law. It is one thing being responsible for one’s own life but causing injury or death of another due to addictive behavior can have a negative impact on the addict’s psychological health. The Chicago rehab network in Illinois, which is part of the US Rehab Network, is made up of many alcohol and drug treatment centers that specialize in detoxification of affected individuals, providing inpatient therapy, individualized counseling, mental health care, and aftercare or follow-up. Allows addicted individuals time to think about their unique situation and focus on adequately starting their recovery process. Since the affected individual has a physical dependence on the product they got addicted to, the chances are good that they will experience withdrawal symptoms. Access to a certified medical detoxification center is then warranted to allow the individual to go through the withdrawal process with as little discomfort as possible. The individual is placed in a safe environment away from others who use the addictive product as well as the drug itself. Medical personnel are available to help manage any acute or urgent medical issues while in the rehabilitation center. Access to psychologists to help address any underlying stressors that may have triggered the addiction. Many psychiatric disorders are seen as potential reasons for addictive behavior and it’s important to address and manage these illnesses if they are present. 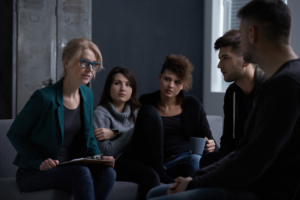 They provide an opportunity to have a buffer between the patient and the outside world to allow them the time needed to address their addiction and find positive ways to help them beat their problem. The biggest benefit here is making use of these facilities after attending an inpatient program as part of the aftercare process. Group sessions are organized where current and previous users discuss their journey with addiction and how it impacted their lives. Being able to relate to someone who went through the same problems makes it easier to understand the potential negative consequences continued addictive behavior may have and how to stay sober. The program helps patients make use of family therapy sessions as these allow the addict understand how important it is to stay sober for the sake of loved ones. Assisting the patient to settle into a community over the long term, especially if they find themselves without work as they will need guidance to find ways to make a living and support their dependents.